Thank you for making us aware of your concerns. We understand that we have since completed the installation. For future concerns please contact us at customersupport@empiretoday.com. 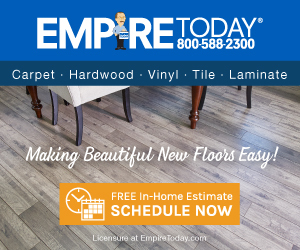 I ordered carpet from EMPIRE TODAY in Staten Island with their Salesman Tony (worst salesman ever!) and got the old bait-and-switch!!! I chose a high quality carpet and when it arrived it was low grade garbage! No wonder EMPIRE doesn't let you have swatches when you make your purchase! They also insist on full payment PRIOR to installation. Luckily, I caught it early and cancelled my order. Even the installers said the carpet was cheap and not worth the amount I was paying. Tony was useless when I called him. He complained that he was too busy to come back to my home to attend to the problem and hung up on me twice. Review #872130 is a subjective opinion of User872130. Thank you for bringing your concerns to our attention. We realize that your time is valuable, and we regret the level of service that you received. We would like to help make things right for you, but unfortunately, we cannot locate your account with the information given.